Situated on the Los Dolses complex, in Villamartin, this light and airy property is just around the corner from the beautiful communal pool and gardens. Los Dolses has it's own commercial centre, where you will find bars, restaurants, a bank and a few shops. 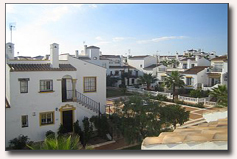 The property is also just 10 minutes walking distance from Villamartin golf course and the Villamartin plaza, with its numerous bars and restaurants. 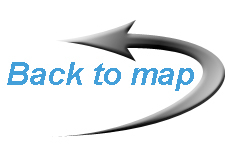 Ideal for family or golf holidays. 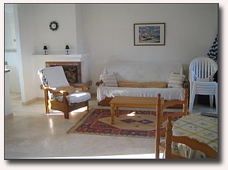 The property consists of lounge/dining area, which has easy chairs and full dining suite. For your entertainment there is a CD player and TV which receives some UK and Sky channels. The open-plan, fully equipped kitchen, has oven, hob, fridge/freezer, washing machine and microwave. There is a double and a twin bedded room and both bedrooms have wardrobes, the master also has a TV. There is a bathroom with bath/shower, toilet & bidet and vanity unit. Both bedrooms have the benefit of ceiling fans and winter heating - but the lounge has the added bonus of air-conditioning. There is a terrace, leading out from the lounge area which is perfect for al fresco dining or providing a shaded outdoor seating area during the hottest part of the day. External, tiled stairs lead up from here to the private roof solarium, which has distant views across to the sea, giving access to the glorious sunshine all day long! There is a patio table with 4 chairs and parasol for your use.The setting is relatively peaceful, overlooking beautiful, open, landscaped gardens. The development is securely gated and has ample car parking. 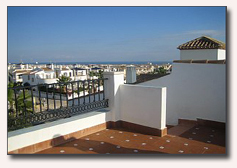 The area of Los Dolses, is set approximately 4 kilometres inland from the coast. Within a 5 minute drive there are several excellent Blue Flag beaches at Cabo Roig, Playa Flamenca, La Zenia & Campoamar so a car is essential to fully appreciate this location. During the months of June-September on each of these beaches you will find a beach bar and you can hire sun beds and parasols. These areas also have further bars and restaurants plus other facilities such as banks and supermarkets. 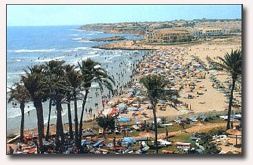 The town of Torrevieja is as close as 10 minutes away by car. 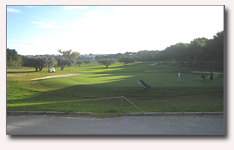 There are many golf courses in the Costa Blanca region. Apart from Villamartin golf course there are Las Ramblas and Campoamar and of course the famous La Manga course which is only 45 minutes drive south of Villamartin. All courses are 18 holes and can be pre-booked. 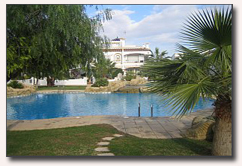 There are further golf courses at Las Ramblas, Royal Campoamar which are 5 minutes away by car. Children are welcome, pets not allowed and the property may be unsuitable for elderly or infirm.We provide bed linen and towels, however, please provide your own towels for going to the beach and the pool.